There's a certain simplicity to stepping on a pedal for a cleaner sound. Genius. Instant clean tone. Easy to use. 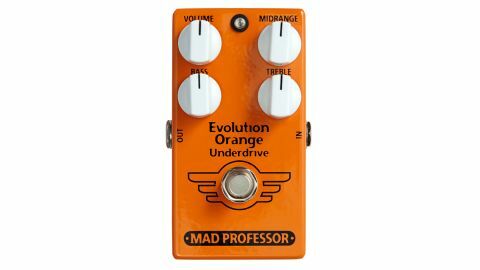 Underdrive: a new category of pedal? Well, not exactly new, as we've seen the HomeBrew Electronics Detox EQ, a Paul Gilbert signature pedal, does a similar job. The idea is that if you have a vintage single-channel amp that you can turn up to find your sweet spot of overdrive, you can kick in the Underdrive to instantly get a cleaner tone when needed. So, why not just use your guitar's volume knob? Well, that can darken the tone to an unwanted degree, whereas the Underdrive turns down the midrange where the overdrive largely comes from, but has bass, midrange and treble knobs to get that cleaner tone sitting just right. It all works really well, too. With the pedal's volume control setting exactly how much the signal to your amp is reduced, youcan clean up a dirty sound while keeping your EQ just where you want it. A bonus is you can use it as a booster if you turn the midrange knob up.